Which website lead tracking software is best? One of the emerging sectors in marketing software is website lead tracking. Put simply, lead tracking software identifies companies or organisations visiting your website based on the IP address used for the visit. Lead Forensics is one of the market leaders but their pricing can be prohibitive for small business or public sector organisations. We’ve road-tested some Lead Forensics alternatives to evaluate which is best. Why use lead tracking software? Would you love to find out who has visited your organisation’s website? Does your website get visits but you’ve no idea who is visiting or what their interest is? Would you like to follow up sales leads with a call or email? Website lead tracking tools will help your organisation achieve all of the above. With lead tracking you can identify and act upon website visits which would otherwise have been anonymous. Several of the software providers also integrate with marketing customer relationship management (CRM) systems like Salesforce or Zoho, so that your website lead can be efficiently managed from cold prospect through to a sale. Enhanced data – merging IP identification with other data sets to provide you with richer information. You’ll see which pages were visited by each company and for how long. Some will show the source of the lead and which keywords your site was accessed through. ISP filtering – removing the many results that simply identify a person’s ISP (like BT Internet) which don’t actually tell you which organisation is visiting your site. 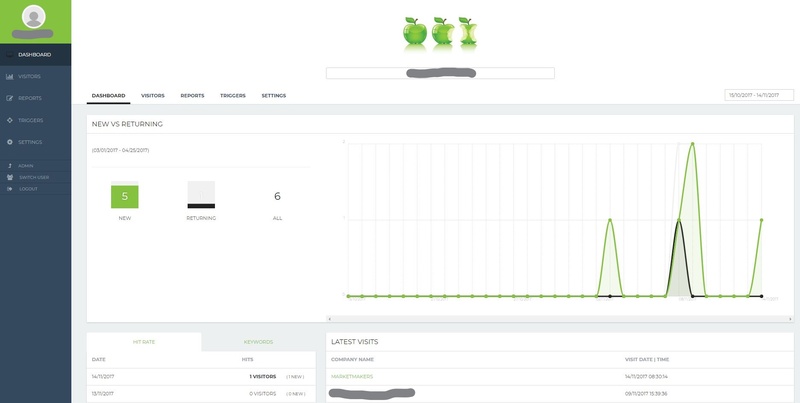 Anyone using a home broadband connection without a dedicated IP will show up in Analytics under their ISP’s name. Dashboard and lead scoring – a clear dashboard of leads which you can categorise or score depending on your criteria. Most provide links to the company’s website, but some add their social media links and information on individuals at the company too. 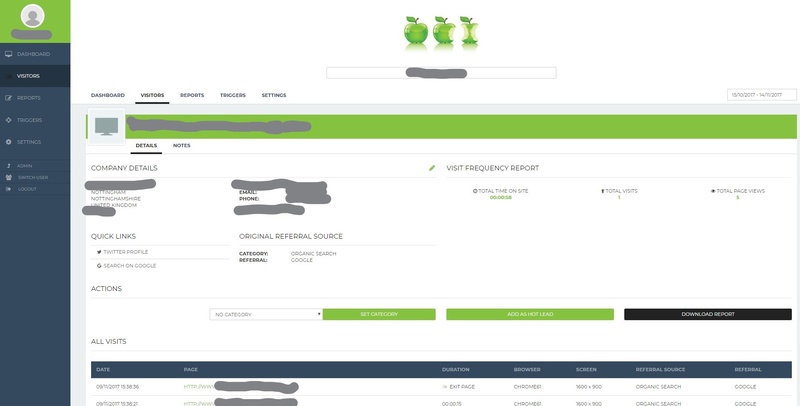 Reporting – some lead tracking systems also provide reporting, allowing you to filter data and receive email alerts when new leads are tracked or conditions are met. Ease of installation – how easy or difficult is the system to install on your website? Lead tracking quality – how many quality leads are identified, and how many ISPs are filtered out? Lead scoring – can you categorise leads as interesting or not, and can you rate them? Quality of dashboard – how easy is it to find relevant information and use the data presented? Integrations – how easy is it to integrate the system with your existing marketing software such as CRM or email? Pricing – most systems price based on the monthly volume of visitors to your website, often with a minimum term of 12 months. Which website lead tracking marketing software is the best? Here is our review of a few of Lead Forensics’ main competitors. For each we trialled them for minimum one week (normally two weeks) on at least one website (more if the trial allowed). Ease of installation – A range of CMS systems are supported with plug ins, including WordPress and Squarespace. Otherwise you add the code to your site. Lead tracking quality – Traffic Truffle scored lower than some of the alternatives, but it was good at filtering out ISP visits. It identified lots of anonymous visitors, giving them personas which served little or no useful purpose. Lead scoring – There’s no lead scoring, but you can select to view visitors of a particular page, and pages can be rated cold, warm or hot, providing you with more options to qualify your visitors. Quality of dashboard – the dashboard is simple and easy to use. There’s also no limit for the number of users you can add to your account. Integrations – There are no other integrations to CRM systems or email marketing system on the basic package. Pro users get access to Mail Monitor which links up to your email marketing system. Traffic Truffle can then tell you if anyone who received your emails goes on to visit your website. Ease of installation –You need to add the code to your site, however if using WordPress you can use a plug-in called ‘Insert Headers and Footers’ to do this for you. Lead tracking quality – Ruler’s dashboard showed more leads than some of the other lead tracking systems however it was less successful at filtering out ISPs. It provided inaccurate location data for some leads (eg Nottingham Trent University is in Loughborough apparently) and provided less information about each lead tracked. It missed one of the key leads we tracked through other systems during the same time period. Lead scoring – There’s no lead scoring, but you can track calls, an integrated live chat and identify keywords and referral websites. Quality of dashboard – The dashboard is pretty basic but easy enough to use. Integrations – Ruler Analytics boasts over 500 integrations due to their partnership with Zapier. Therefore you can integrate with your chosen CRM or email marketing system easily. Pricing – Their lowest published price is £99 pcm. Ease of installation – Just like Ruler Analytics you need to add the code to your site, however if using WordPress you can use a plug-in called ‘Insert Headers and Footers’ to do this for you. Lead tracking quality – Whoisvisting fared well compared to the other systems trialled during the same time period. The majority of ISPs were filtered out, and some good quality leads were identified. Lead scoring – Whoisvisiting allows you to categorise leads but not score them. You can create your own categories which is helpful. Quality of dashboard – The Whoisvisiting dashboard is one of the nicer layouts for ease of use. Its easy to see how many pages each lead has visited, and for how long. You are able to tailor the columns to meet your needs, for instance location of lead. If you’re only interested in visitors to a particular page or section you are able to set triggers which alert you to new visitors. As with many of the other systems there are reporting tools too. Integrations – The only integration currently offered is Salesforce, with the promise of more to come. Pricing – Their lowest published price is £38 pcm. Ease of installation – CommuniGator have their own plug-in for WordPress which makes it easy for website users to install. Lead tracking quality – Probably the best at identifying leads out of those we trialled during the same time period. This is likely due to published IP data being augmented by their own database built from email campaigns and their partnership with Zoominfo. Lead scoring – CommuniGator creates its own score of each lead based on a variety of factors such as number of pages viewed. Leads can be allocated to other team members to follow up. Quality of dashboard – As CommuniGator is just one element of a complete marketing automation system the dashboard is more complex but nevertheless still easy to use. Information for each lead is detailed and hyperlinked to external sources. Integrations – As well as its own suite of marketing systems CommuniGator integrates with leading CRMs such as Salesforce, Zoho and Microsoft Dynamics. CommuniGator offer a personalised URLs tool (PURLS) so that you can create unique URLs to send to prospects in your emails, and then track if they have visited your site. Pricing – Their lowest price is £75 pcm. So which website lead tracking software is best? Ultimately the decision will depend on the importance of factors such as ease of installation, lead scoring and so on for your organisation. In terms of best at tracking quality leads CommuniGator stole the show with Whoisvisiting in second place with a lower cost offering. As all the above website lead tracking systems offer a free trial there is no reason not to run your own comparison with Lead Forensics or any other website lead tracking software that catches your eye. Are there any website lead tracking software providers we should review next? Do let us know.